My task this year is to learn, relearn and polish up all of my knowledge and put together a religious and spiritual practice based on my experience and my ancestry. As I put together something (ANYTHING at this point!) to celebrate the Imbolc holiday, I have realized that this task is much easier said than done. The first thing that I have done is to start going through my older holiday ceremony, go through historical information and taken a look at what some other bloggers have said about the holiday. But after I gathered all of that information, I realized, that is all great for these other people, but it’s not ME; it’s not MINE. I am quickly realizing that in order to be true to my ancestry, I’m going to have to start putting together things on my own. I am not a re-constructionist, even though that would seem to me to be the easier path. I am not fully Celtic nor am I fully Pagan, as my German ancestry still screams to be heard. I am also not fully of the Norse, as the Native blood in my veins quickly reminds me that Turtle Island is my home. But yet I am not fully Native, as the Anglo Saxon/Irish heritage stirs my soul. It’s made things pretty difficult, to say the least. But as I said when I built this blog in the first place, this is for me to vet and work through my own beliefs and practices. With that in mind, I plan to ask my pipe if it wishes to be smoked during Imbolc to honor my Native heritage. I will bless my gardens in honoring Beyla, the landwrights and vaettir and my German heritage. Finally, I will do a small fire ritual to honor my Celtic heritage. Perhaps in time I will be able to blend all of these into one full ceremony, but until I can wrap my brain around the mingling of traditions I guess it’s going to have to be separate. On New Years Day, I have tendency to wake up with a feeling of dread. It seems to me that years past have either been great, or horrible. There is normally no in-between. By February of the year I start to figure out what type of year it will be, so the month of January is one of anxiety and stress. This year I am happy to say that I did not wake up with that dread. And while I still have some apprehension, I am more optimistic. 2015 brought me the gift of starting to feel better in my own skin, of recognizing that I am worthy, strong and beautiful, and that I can handle things much better because I recognize my worth. So with that in mind, I realize now that I am more in control of how my year goes. This new thinking has also changed my opinion on New Years resolutions. So many people think thoughts about fitness, diet and health around this time of year, but they do it for the wrong reasons. They think that this will be the year that they become the person they want to be, instead of looking at becoming more of the person they truly are. They don’t like themselves, have low self worth or just all around hate their body. So the New Years resolution just becomes another vehicle to hate themselves with when they set themselves up for failure. And boy have I been there. So this year is going to be a little different. This year I shall let the feeling of being enough, of being worthy, strong and beautiful settle deep into my bones, so that I do not lose this memory again. I am also going to start structuring my practice around this, doing more things that feel authentic to me, and worry less about what the lore or common belief holds. Yes those are things to take into consideration, but if I really wanted a book of ancient writings and someone to spoon feed my belief to me in order to tell me what specifically to do and not to do with my life I would have stayed a Christian. To me, Paganism is more about finding what your own path truly is, becoming more authentic to yourself, becoming more active in worship and working to make this world better. 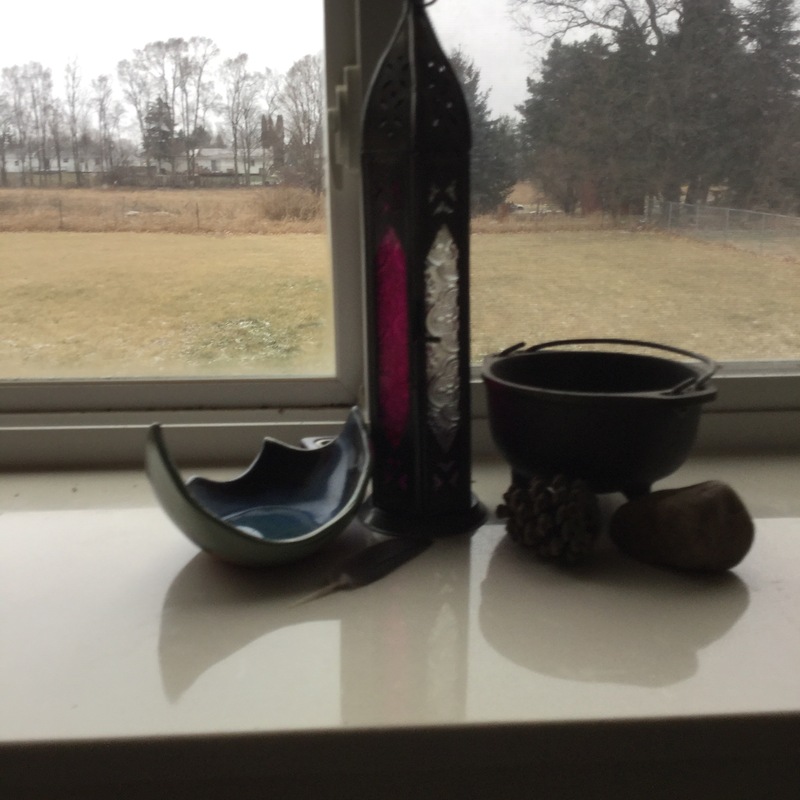 So with these things in mind, I want to present two altar spaces that I have created in my home over the past several months that I want to develop regular practices with. First, my house vaettir altar. This altar has been in the works for awhile, and now that I am figuring out more variations on my offerings I wanted a place to do that which is more permanent. Currently the cauldron holds incense that was burnt last night to cleanse my home before the new year. 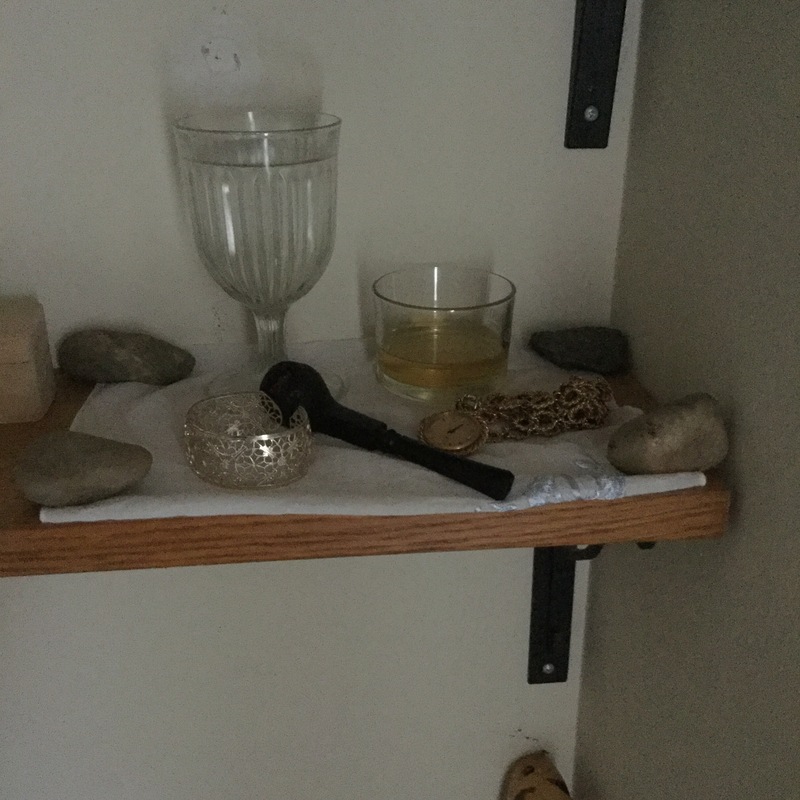 Second, I have moved my ancestor altar to another area of the house where it is more visible, and thus I remember to utilize it more often. Currently my altar holds a small pipe of tobacco for my Native Ancestors and jewelry from my Grandmothers who have both passed. I also have mead as an offering right now on the altar. For me, it feels right to start giving thanks as the crops grow and the time of the first harvest. So when Thanksgiving rolls around, it seems to me like it’s a little late. However all of the blog posts about gratitude got me thinking about something that I haven’t ever said I was grateful for, and that is being grateful for myself. Being raised Roman Catholic, you don’t get to think much about taking care of yourself. In Roman Catholicism you are taught in a nutshell that things happen to you because you are bad. Further, you are expected to sin or else they would not require you to confess those sins several times a week. Another example is the host in communion. Not only do you have to ensure your soul is pure by confession but you also have to consume a wheat host once a week in order to receive the blessings of Jesus. You are considered outside of the church if you cannot receive the actual host for communion every week. Unfortunately for me, even if I wanted to be in communion with the Catholic Church I could not be. I cannot eat wheat, and wheat is a required ingredient in a host according to Roman Catholic doctrine. So in essence, something I cannot control causes me to not be in communion, and thus my future in heaven is in jeopardy. Therefore, something I cannot control makes me evil, and I could either give into that evil or I have to literally eat poison to be saved. As you can tell, the Catholic Church doesn’t have a very good reputation of empowering their true believers. The Catholic Church isn’t the only thing out there that makes us feel bad about ourselves. Over and over again in our families, in the media and by our friends and acquaintances we are told we are not good enough. It has gotten to the point that we don’t even know that we are doing it to each other anymore. Someone’s actions are misconstrued into looking like something with a negative intent, and that is all it takes to allow our minds to start beating ourselves up. A minor miscommunication from a mother or father changes a child’s thinking, and thus insecurities form. Media outlets scream advertisements that tell us we aren’t thin enough, pretty enough, don’t make enough or are not smart enough. Bullies at school do things that we carry with us throughout our adulthood. Bosses, coworkers and classmates gravitate toward specific individuals and thus someone feels left out. One by one these things pile up until the thought of not being good enough, not being powerful and secure in who we are is considered normal. So we reach for the things that make us feel better. We reach for religion, the thought of being in an inclusive group is comforting. We reach for food, as it feels better to stuff our feelings down into our stomachs instead of expressing them. We reach for material goods just to try to fill that hole deep within us, but nothing really satisfies. Nothing at least, until we realize that the hole we are trying to cover up isn’t a hole at all. It is actually our own potential as human beings. As I go through the stillness of these dark months I am realizing that I am enough. I am full and complete just as I am right now. I have potential, I am powerful and I am worthy of carrying the mantle as a Priestess of the Gods and Goddesses that wish to have me. I am worthy of working with the spirits of the land, and I am worthy of my ancestors. I am worthy in this life to be whom I wish in this mundane world; and I am strong enough to make a difference in the endeavors of my choosing. This does not mean there isn’t work to do and it absolutely doesn’t mean that I am entitled to be handed anything. But what it does mean is that I know I am strong enough to move things forward in the way I need them to be in order to pursue my goals and dreams. This also doesn’t mean that I am exempt from the circumstances of my choices. I still have my karmic debt to deal with, and I can choose to make more of that debt to be paid, or I can start to erase it. The choice is mine to make. We have too many things in this life that scream at us that we are unworthy of being who we choose to be. Let this writing be a spark to others to realize that things can change deep within ourselves to the point that we feel worthy again. Let us each look deep into our soul and realize that we each have our personal truth of who we are and what we can accomplish. Let us each recognize the astonishing light of our own being, and may we use it to honor the Gods and our ancestors by being beacons to those who are in a place so dark that they cannot find their true light within themselves. After all, what could be more pleasing to the Gods than for them to see us recognize our true potential and use that to help others? So for this Thanksgiving, I am choosing to be grateful for starting to learn my personal truth. And I am grateful that I can find the words to share this truth with others. I am grateful for my strength, my beauty, and the realization that I am enough. And I am grateful that I have the opportunity to honor my Gods and my kin with who I am and what I choose to be. I take a break from my day job by taking a daily walk around the area near my work. Normally, the stroll involves a dead end street that has very few businesses and lots of trees. As fall hits the Midwest, I have been struck by how much the trees have changed after the falling of the leaves. The trunks of some of these trees seem like they have become whiter as the days grow colder. That whitening very much reminds me of the process of bones being whitened by their exposure. The analogy fits for the time of the year. The celebration of death and the harvest has come and gone. Now we are catching our breath and be still before the rush of holiday mundanity hits us between Thanksgiving and New Year’s day. The vision of those whitening trees awoke in me another realization. It takes stillness to start the transformation into something new. Stillness allows you to look within yourself and listen for the voice that gives you direction to move forward in a new way. We must make time for that stillness in order to understand what our next steps in this life are in preparation for the new beginnings of Yule. This is so very true for me in this moment. I recognize the need to be still and let my own bones picked clean of things that I no longer need in my life. I need to recognize the fact that I am enough. I don’t need the baggage I have carried around for years in order to move forward spiritually anymore. I am OK to be who it is I am; no gimmicks, no self-imposed guilt, no Ego. Just me, myself and I standing in the dark, ready to accept what is in store. It’s harder than it sounds; I felt like I have pushed myself to have control for a significant portion of my life. Now in many aspects of my life I am no longer in control, and I have had to learn to be OK with it. Further, the only way to really be true to what it is I am and what I am to do is to recognize that I don’t need to be in control of what is happening. I just need to learn to trust myself and my strengths in order to get through this time within my life. When I started this new path, I was told that things would be uncomfortable; but that I would never be lead into things I could not handle. I deeply trust in that. I am being asked to be still and look into that which I am frightened of during this dark time of the year. I will do my best to do just that.